The tunable laser spectrometer in the SAM (Sample Analysis at Mars) instrument of the Curiosity robot has unequivocally detected an episodic increase in the concentration of methane in Mars' atmosphere after an exhaustive analysis of data obtained during 605 soles or Martian days. This has been revealed in an article authored by scientists from the MSL (Mars Science Laboratory) mission, recently published in Science. One of the authors of this article is Francisco Javier Martín-Torres, a researcher at the Andalusian Institute of Earth Sciences (CSIC-UGR). This puts an end to the long controversy on the presence of methane in Mars, which started over a decade ago when this gas was first detected with telescopes from Earth. The controversy increased afterwards with the measurements obtained by orbiting satellites, some of which were occasionally contradictory. These new and incontrovertible data open paths for new research that can identify the sources that produce this gas—which could include some type of biological activity—and the mechanisms by means of which the gas is eliminated with such inexplicable speed. Ever since the Telescope in the Mauna Kea Canada-France-Hawaii Observatory first announced the detection of methane in the Martian atmosphere, several other measurements of the gas have been conducted by means of a diversity of instruments, both remotely from earth, and also by means of satellites like the Mars Express and the Mars Global Surveyor. Since methane can be the product of biological activity—practically all the existing methane in Earth's atmosphere originates in this way—this has created great expectations that Martian methane could also be of a similar origin. These observations appeared to be contradictory. Some of them suggested a distribution pattern that was limited in space (with its source in the Northern hemisphere) and time (with a peak of concentration during summer in the Northern hemisphere and its subsequent vanishing in just a matter of months). Both facts are inexplicable by available photochemical and general circulation models, which are currently used to define our understanding of Martian atmosphere. According to these models, if there really existed methane in Mars, it would remain there for an average 300 years, and during this period it would be homogeneously distributed across the atmosphere. Since we lack a model that can account for its generation, localization and swift disappearance, detections were all called in doubt, and the results were attributed to the instruments employed in their detection, which were working on the very limit of their capacity, and also to the fact that the concentration values of the gas that they yielded were of the ppbv order (parts per billion by volume). "Within this context, and when we were all almost fully persuaded that the data we had so far collected were at the very least rough it not fully invalid, the expectations to decide on this were bestowed upon the capacity of the SAM instrument to come up with more precise measurements", says this researcher at the Andalusian Institute of Earth Sciences. By means of its TLS unit, SAM has been detecting basal levels of methane concentration of around 0,7 ppbv, and has confirmed an event of episodic increase of up to ten times this value during a period of sixty soles (Martian days), i.e., of about 7 ppvb. The new data are based on observations during almost one Martian year (almost two Earth years), included in the initial prediction for the duration of the mission (nominal mission), during which Curiosity has surveyed about 8 kms in the basin of the Gale crater. During this period, which comprehends all the full cycle of Martian seasons, the reference to the environmental data collected by the meteorological REMS (Rover Environmental Monitoring Station) station has allowed for the establishment of possible correlations with the environmental parameters that this instrument records: relative humidity, temperature and atmospheric opacity. 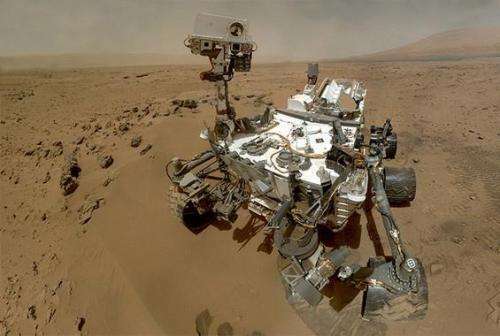 Data on atmospheric opacity was obtained both by the UV sensor in REMS and also by MastCam (Mast Camera), the camera at Curiosity, which is employed for support in atmospheric surveys. REMS is an instrument that has been developed and it is being scientifically exploited by Spanish researchers, some of whom have been members of the team that has conducted this important research. The hypothetical existence of seasonal variations in methane concentration in correlation with certain environmental variables, in any case, will be only confirmed through sustained measurements in the future, specifically oriented to establish which factors can determine the sporadic emission and subsequent degradation of this gas in Mars. As far as the spatial disposition of the methane plumes, they have concluded that they are generated in very brief and weak events and in very specific places. TLS is a two-channel tunable laser spectrometer which analyses in the infrared region—more specifically in a 2,7 μm wavelength through the first channel, and 3,27 μm through the second. The latter channel is specifically prepared for the detection of methane. It has a resolution of 0,0002 cm-1, which allows for the detection of methane through its spectrographic footprint of three very clearly defined lines, and the procedure which is applied (laser light absorption through a sample contained in a closed cell) "is simple, non-invasive and sensitive" as the article itself claims. The containing cell can be full of Martian environment or as a vacuum to make contrasting measurements, which include some conducted through artificially increased concentrations, "which has resulted in a very reduced margin for error and guarantees the accuracy of results, which can now be deemed definitively conclusive", says Martín-Torres. According to him, the new questions posed by these results far outnumber the answers it does provide. "It is a finding that puts paid to the question of the presence of methane in the Martian atmosphere, but it does pose some other more complex and far-reaching questions, such as the nature of its sources—which must lie, we believe, in one or two additional sources that were not originally contemplated in the models used so far. Among these sources, we must not rule out biological methanogenesis. Another new question is related to the bizarre evolution of methane in the Martian atmosphere after its emission. Both questions should be addressed in the future with specifically designed new research." The newly arrived MAVEN (Mars Atmosphere and Volatile Evolution) from NASA will immediately provide continuity for the study of this subject, and in the near future the Trace Gas Orbiter (TGO), jointly developed by the European Space Agency (ESA) and the Russian Space Agency (Ruscosmos), which is also part of the ExoMars mission, will measure the concentration of methane at larger scale, and it will allow for the establishment of a framework to contextualize the results obtained, and deepen our knowledge of methane dynamics in Mars. Why is everyone vying for a piece of Mars? We may all be Martians originally. So what, exactly, did our earlier expeditions (1970s) leave up there? This wouldn't be contamination from Viking or any other Terrestrial source. If contamination from Viking spread so far in 40 years that its methane could be seen by Earth based telescopes and detected by the rovers, it would mean Mars was INCREDIBLY fertile. Any martians may be Ceresians or Vestans, for that matter. And those might be extra-solar. Remember, It's turtles all the way down. ... of course there is microbial life on mars. It would be stupid to believe otherwise. There is microbial life everywhere in the universe wherever it can survive. No great discovery here. Mars is a waste of time and money studding it ... as it cannot amount to anything of significant value for the human race. Many location in our solar system have magnitudes more value than mars. Even the moons of mars have more value as places to land and set up bases than mars itself. ... of course there is microbial life on [Mars]. It would be stupid to believe otherwise. There is microbial life everywhere in the [Universe] wherever it can survive. No great discovery here. WTF are you talking about? The discovery of life on alien worlds is one of the greatest mileposts a technological civilization passes. Those are fine unsupported assertions--care to supply any actual evidence to support them? Never mind, that question is clearly rhetorical, because we all know there is none. It's not even that I disagree with you on these points, but you can't simply declare an unknown to be a known (someone stop me--I'm starting to sound like Donald Rumsfeld) and then insist that all science toward that end is a waste because you have declared it so. Thanks, PhotonX. Better reply than what I could have done (not to mention far more polite). Other problem is that if the Science paper referred to here is the one I read, then the methane measurements did NOT rule out sources from the rover itself. That is, results are not definitive (as viewed by a CRITICAL unbiased observer). OTOH, "proof" is evidence sufficient to convince. By definition its subjective. gentlemen ... my prelude to the important part of my message was purposefully assertive to get people off the stupidity of continuing waste money on studying Mars. If Mars is proven to have life on it or not is an insignificant achievement. If mankind is to evolve into a space faring race it must get moving before we go extinct from a meteor, cosmic ray, CME, giant volcano etc. by staying on this one planet/target. That microbial life and others exists everywhere in the universe where it can survive should be an accepted hypothesis unless proven otherwise. I put it to you that there is evidence that there is life everywhere in the universe because there is life everywhere on earth where it can survive. There is nothing special about earth. it is no different than any other similar place in the universe. earth is proof enough that there is life everywhere in all possible states of evolution as we have seen here. For a moment there I thought they had new detections, but it is the publication of the old data. It isn't unambigious detection of life, serpentinization produces methane, or life now, clathrates can persist for billions of years. But it is evidence of geological activity now, and a more habitable environment at the time the methane was produced. @gkam: Of course, or any extant or extinct life on Mars can originally have emerged on Earth. But local emergence is more likely. There are two models that naturally prefer martian emergence. The old one was those who were bothered by earliest fossils appearing so close after the late bombardment. But we now know that was survivable, and that Earth was cold and wet already 4.4 billion years ago. The new one is Benner's mineral catalyst pathway, which needs a dry place for one of its crucial mineral catalysts. But that isn't the likeliest pathway, it has far less homologies to modern cells than submarine alkaline hydrothermal emergence. @TC: Nothing is "a waste of time and money" researching. If you believe that you don't understand science, and you haven't read the NASA papers on how it observably isn't. Also, be careful, because there are individuals that simply troll science sites with such erroneous proclamations, as if such ideas would affect science or our need for it in any way. Life elsewhere is of course a bad null hypothesis for isolated outcomes, which is non-existence until proven. But we have one example, and thus expect many more, it would be a terribly finetuned process that results in only one (or zero, or a few) examples in a possible bin. Also, life emerged sufficiently early on Earth that we can say that it is an easy and/or frequently attempted process. One would again have to put unlikely scenarios of many different pathways, each finetuned to be difficult, as an alternative. Just a question. If life spontaneously forms on planets, and or possibly any body in space. How come it has never just appeared on earth since the "original time", or has it? Considering how conducive to life this planet is, I would think it would have repeated here often. @IMD: That was a question Darwin choose to address already 2 centuries ago, because he considered it a possible stumbling block for his theory. Conversely, by solving it he provided a successful test. Now, what do you call biomolecules that hangs around in the environment for days or weeks? That is right, "food". So new attempts at abiogenesis can't succeed, because life is already here.